A patient is admitted to a small town ER. An X-ray of an injury is taken by the hospital staff, only the hospital does not have a radiologist on staff. To save time, the X-ray is transmitted to a hospital in a major city, which has a radiologist on staff around the clock. The radiologist reads the X-ray and using teleconferencing, gives his evaluation of the patient to the ER staff. With specialists sometimes unavailable in emergency rooms in rural areas, patients are forced to wait until one can arrive, or have to be transported to a hospital where a specialist is present. Videoconferencing brings the specialist to the patient. The core technology used in a videoconferencing system is digital compression of audio and video streams in real time. The components needed for teleconferencing are: video camera or webcam to capture the images; a receiver, such as a television, computer or projector; microphones; speakers; an analog or digital telephone network (LAN or Internet); and a computer that ties everything together, compressing and decompressing the images, as well as maintains the linkage. Polycom® RealPresence™ video and voice collaboration solutions can potentially change the way healthcare organizations learn, teach, and deliver care. Hospitals are turning to telemedicine to reduce the problem of distance medicine. 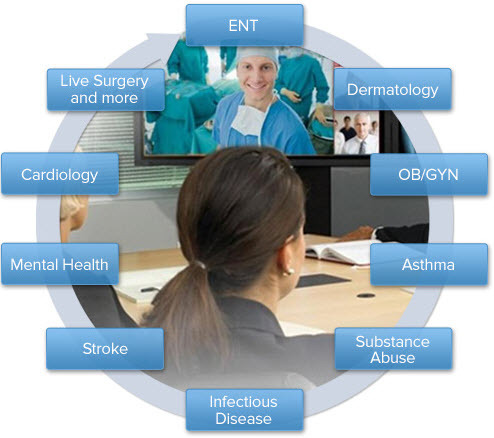 RealPresence video brings healthcare providers and remote, home-care, and quarantined patients together for discussion, assessment, and monitoring. Specialists can now consult and prescribe treatments from their office, or while traveling, using HD smart phones. The TANDBERG CPS will help increase the quality of patient care and hasten the administration of life-saving treatments via video conferencing. The CPS has high definition video quality, consisting of a 1080p full high-definition system with a 12x optical zoom camera, which provides the clearest possible picture and position for maximum field of view. Mobility is obtained using a rechargeable battery. The CPS has modular storage options to allow medical professionals to store and transport medical devices, laptops, PCs, keyboards and light sources. 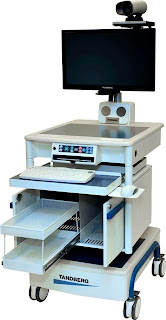 Hospitals are known for heavy abuse of equipment, but the CPS is designed to withstand all hazards with a rugged exterior, tactile membrane control on front panel and disposable splash guards, which ensure increased sterility and durability needed in telemedicine environments. TANDBERG’s parent company, Cisco, developed a system named, TelePresence,™ which creates an immersive, face-to-face experience over the network. The TelePresence technology gets critical-care neurologists and other specialists to patients' bedsides within 15 minutes to quickly assess and take action for stroke patients. Used in the radiology and pathology departments, TelePrescence helps facilitate faster teamwork between departments and other hospitals, resulting in quicker and more efficient diagnoses. One of the biggest trends in healthcare is digital signage because of its many advantages to everybody from patients in the waiting room; guests and visitors in a hospital lobby looking for a room, physician, or employees on call in the dining room, and directional information in elevators. Digital signage can direct patients and visitors to their destination; show what services are in particular buildings; list medical facility personnel; promote specialty practices; and market hospital specialties. Finding your way through a hospital or large medical facility can be a challenge. Using a touch screen kiosk or digital signage can make it easy for a patient or visitor to find their way by displaying detailed map diagrams, physician directories, and directions between two points. Sitting in a waiting room is no fun, especially when all of the magazines are two years old. By using digital signage to deliver informative material and educate visitors, hospitals and healthcare facilities can enhance sales of services or products by entertaining and educating viewers. 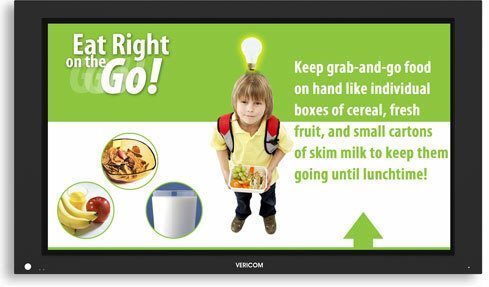 Digital signage can be displayed in break rooms and lounges to inform employees of important information, policy and procedure changes, notices, and training opportunities. The Flathead City – County Health Department in Flathead County, Montana employs Vericom’s ChannelCare digital signage in its Women, Infants, and Children’s Center. The WIC program provides supplemental nutrition information to low income pregnant, postpartum, and breastfeeding women. Messaging informs the community about car seat programs, cancer prevention, immunizations, and home visit programs for pregnant women, teen pregnancy programs, puberty and reproductive health classes. Custom whiteboards are an important part of scheduling in hospitals. 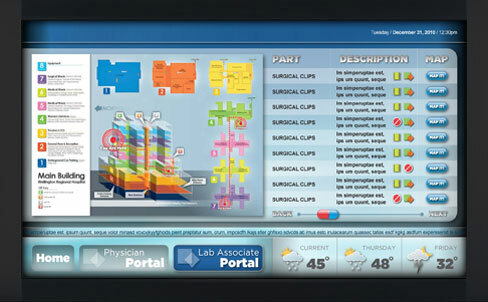 Magnatag Visual Systems has a variety of scheduling boards, such as their O.R. surgery scheduling board. A surgeon can make instant scheduling changes, using unique 2-sided write-on 35" Long FlipOver® Magnets. The surgeon can write the key procedure data on them at his/her desk with dry-erase pens, then overlay the magnetic strip to the board. Magnatag also makes custom white boards for patient care, admissions and bed control, staff status, E.R. patient progress and many more. Custom printed Boards.com, Digital Designed Solutions Inc, Magnetic Concepts Corp, and US Markerboard also manufactures custom medical whiteboards. 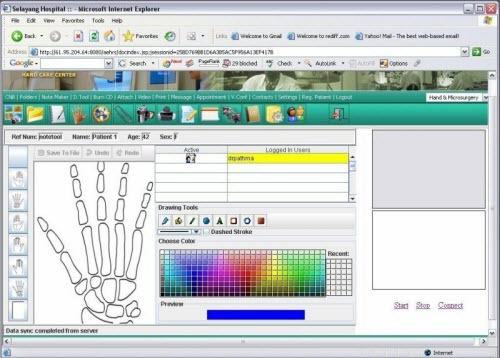 Prognosys Medical Systems’ interactive whiteboard for continuing medical education allows doctors to share an image for discussion. An electronic whiteboard promotes efficiency by replacing the traditional whiteboard in cardiology labs, radiology departments, nursing, OR, ER, and surgery centers. An electronic whiteboard moves with the doctor by incorporating the use of touch screen monitors, such as iPads, Android tablets and smartphones. An electronic whiteboard manages staff, and allows for centralized communication from any location. Companies, such as Intelligent Business Solutions eWB, Scan Am Company, and Sharp, provide electronic whiteboards. 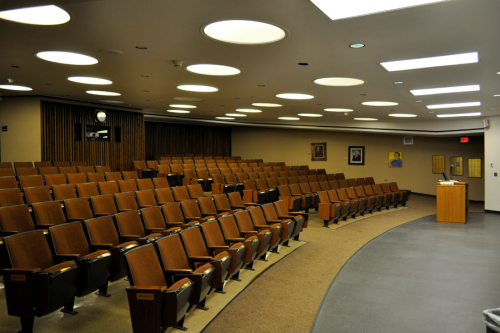 Lectures and conferences are an important part of medical training and advanced learning. A state-of-the-art facility has the latest audio visual equipment, such as a digital projector, document camera, Panopto lecture capture software, streaming recordings of all lectures and an audience response system (ARS) for polling, testing and collaboration. Lecture capture technology, such as Panopto, has allowed both administrators of the lecture, as well as those using the software as end-users, the simultaneous capture of audio, video, and any application used on-screen, including Microsoft PowerPoint, which is still the most popular lecture format. This technology is a flexible and easy-to-use presentation capture platform, which allows users to capture, edit, archive and share recordings. In fact, the software can also capture interactions, with or on, any device plugged into the PC including sympodiums, visualizers and Blu ray players. The content can then be distributed automatically to the web, and to mobile devices, including iPods as well as a range of other playback devices. In any teaching environment, an audience response system increases material retention in continuing medical education (CME) programs and significantly simplifies the testing, grading and certification processes. CME attendees reported that the ARS made presentations more fun, helped them be more attentive, and allowed them to learn more than they would with traditional lecture formats. 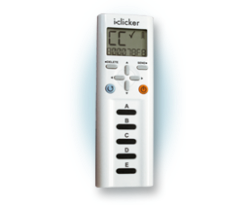 Audience response systems or “clickers,” as they are sometimes called, allow medical personnel in the auditorium to instantly provide feedback, answer questions, and vote in response to questions that are posed. Each attendee uses a "clicker," which is a portable, handheld device that allows them to vote or make a selection by pressing a button. A receiver which is connected to a computer's USB port collects the results sent via radio waves from the students' clickers. The instructor can assess the attendees’ knowledge, keep their attention, provide immediate feedback, and encourage all attendees to participate. The roll of audio visual in the medical field is evolving and growing, but what is important is the fact that not only is the standard AV equipment, such as projectors and screens, important, but also integrated computer technology.